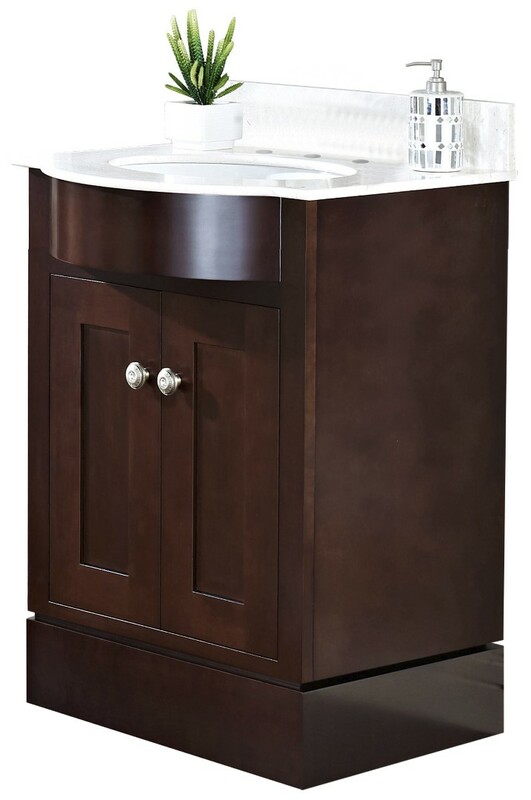 THIS PRODUCT INCLUDE(S): 1x undermount sink in white color (68), 1x vanity base in coffee color (340), 1x miscellaneous part in coffee color (347), 1x marble top in beige color (351). Features a large cabinet with two soft-close doors with European style hinges. Includes the luxurious cabinet hardware with cut-glass insert. Includes oval undermount sink. Premium white glaze for a glossy finish with a kiln dried ceramic construction. Features attractive veining and swirls that give each piece a unique look. No assembly required. Accessories not included. Solid wood frame with no MDF or chipboard used. Crafted with American cherry wood and veneer. Quality control approved in Canada and re-inspected prior to shipping your order. Knock-out plumbing backboard for easy water supply and drain access. Machine cut and tapped for smooth chip-free edges. Multi-layer 7-step stain finish enhances the grains of natural wood and gives it a luxury look. Vanity is completely finished inside out including the back of vanity. Sink features an overflow. Fully adjustable in-out and up-down European style hinges are completely concealed when door is closed.